Football - Calder 76 v Hebden Royd Red Star. Ben Barker for Calder and Jack Gormley for Red Star. Hebden Royd Red Star went second in the Halifax AFL’s top flight, and added to the worries of their Calder Valley neighbours Calder ‘76, with a 6-1 win at Holmes Park Luddenden Foot. Red Star are unbeaten since losing narrowly to Midgley United in their seasonal opener and they were completing a double over the bottom side, having beaten Calder 5-2 at Mytholmroyd in early September. Red Star took the lead midway through the first half with a Lewis Cockroft penalty but that turned out to be the only goal for Star’s prolific marksman. Tom Barclay doubled the visitors’ tally with an excellent curled shot into the top corner but George Hampshire’s spot kick just before half time gave Calder hope. However, Red Star scored at regular intervals throughout the second half with Jack Gormley’s back-post tap-in to make it 3-1 denting home hopes. Diminutive left winger Foysol Ahmed scored with a chip; Gormley made it 5-1 with his second; and Will Chadwick completed the scoring with a diving header. Midgley United boss Craig Gee was pleased with the way his table-topping side recovered from their first Premier Division blip of the season with a 3-1 home win over Greetland on Saturday. “We played really well - probably as well as we have all season,” said Gee, whose side had not only suffered a shock home reversal at the hands of Denholme United the previous week but had lost to Greetland in Challenge Cup at Saturday’s venue. Home supporters must have been fearing the worst again when Tom Wall gave the visitors the lead inside five minutes, producing a smart finish from a ball across with the Midgley defence caught flat-footed. The home side played their way into the game and looked the better team. Rob Stansfield headed them level from a Tom Rawnsley cross and George Bamford gave them the lead approaching half-time after getting on the end of a through ball and finishing a one-on-one chance. Midgley continued in the ascendancy after the break and a fine individual goal from Toby Standring extended the lead. He cut in from the left, beat off two of three challengers and then finished into the bottom corner. 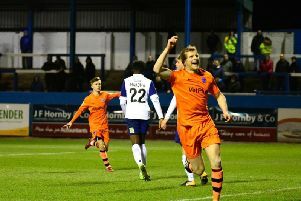 Midgley played the last 15 minutes with 10 men, after Standring went off injured, but held firm to make it six wins from seven in the Premier this season. Honours were even in the battle of the two Shelf clubs, both possible title contenders, who fought out a 2-2 draw at Westwood Park. Hosts Shelf FC, the reigning champions, fought back from 2-0 down to grab a 2-2 draw against United, leaving visiting boss John Lister disappointed. He felt the game had hinged on a couple of decisions in the opening 45 minutes. The first came after 15 minutes when Billy Grogan went through and a home defender slipped on the edge of the area and denied the United man by handling the ball. Lister thought the home player was the last man and might have been dismissed but United at least opened the scoring from the resulting free-kick via Luke O’Brien. United doubled their lead five minutes later through David Chappell following Johnny Butterfield’s through ball. Shelf FC were thrown a lifeline before half time when they were awarded a penalty for hand ball after a bout of ‘pinball’ in the visitors’ area. Callum Lewis converted from the spot and he headed the home side level from a corner after an hour. Both sides had chances to win a tetchy contest after that with Pawel Szypulski making a fine double save to deny Chappell. Sowerby United beat Ryburn United 2-1 in a meeting of sides desperate for points. Sowerby enjoyed the better of the opening half hour but failed to find an end product. Five minutes before the break they did get a breakthrough when Rory Thickett raced clear and slotted home. Midway through the second half Dan Boyd doubled the lead with a delightful curling shot. Sowerby looked in control but wasted several golden chances. When Ryburn had a man dismissed it looked all over for them but they raised their game and when Garry Ash pulled a goal back it led to a nervy last 10 minutes for Sowerby.